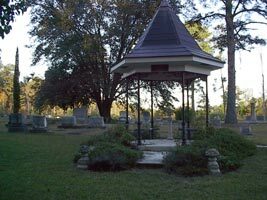 Pachuta, located on the western boundary of Clarke County, was founded in 1882 and incorporated in 1890. The town was so named when the New Orleans & North Eastern Railroad (now Norfolk & Southern) was built through the area. Prior to the coming of the railroad, the area was inhabited partly by tribes of Choctaw Indians from whom Pachuta obtained its name as well as its land. Circa 1892 • Highway 11. Historic railroad depot formerly used as a town hall. Currently houses Indian artifacts, railroad equipment, and items from the Pachuta Creek oil field. Shown by appointment. (601) 776-3131. Old cemetery with attractive arched entrance.